This program is not targeted towards, nor intended for use by, anyone under the age of 18. If you are under the age of 18, you may not use the Club Escobar Rewards Program. Your points may be redeemed at any time, just so long as the needed points are accumulated for your desired item or discount. Visit the Escobar Cigars web store at www.escobarcigars.com and browse our selection of premium handmade cigars. After you have added items to your shopping cart, simply proceed to checkout. This is where you will be prompted to “Login” if you already have an existing Escobar Cigars Account, or you can create an account. Note: You must sign into your account or create an account to sign up for the Club Escobar Rewards Program. Proceed to “Make Payment” to complete your transaction. Congratulations you have just earned Reward Points! After you click “Make Payment” to complete the checkout process, your Loyalty Points are automatically accumulated and added to your account and can be seen during your next visit. If you are logged into your Escobar Cigars account, then simply add items into your shopping cart. 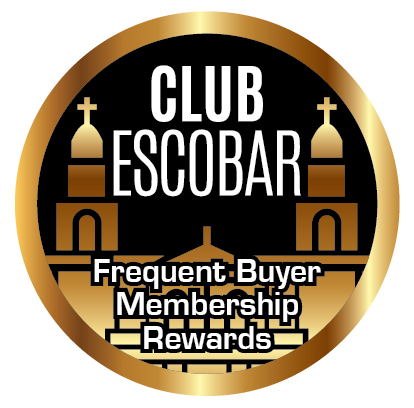 At checkout, the option to utilize accumulated Club Escobar Frequent Buyer Membership Rewards Points will be provided. The associated amount of points used will then be deducted from your points total. User point totals can be seen in your account profile at any time.